Ticketing: $25 Reserved Seating. Your purchase includes a complimentary copy of Why Don’t You Write My Eulogy Now So I Can Correct It? : A Mother’s Suggestions, which will be available for pick-up at the event. 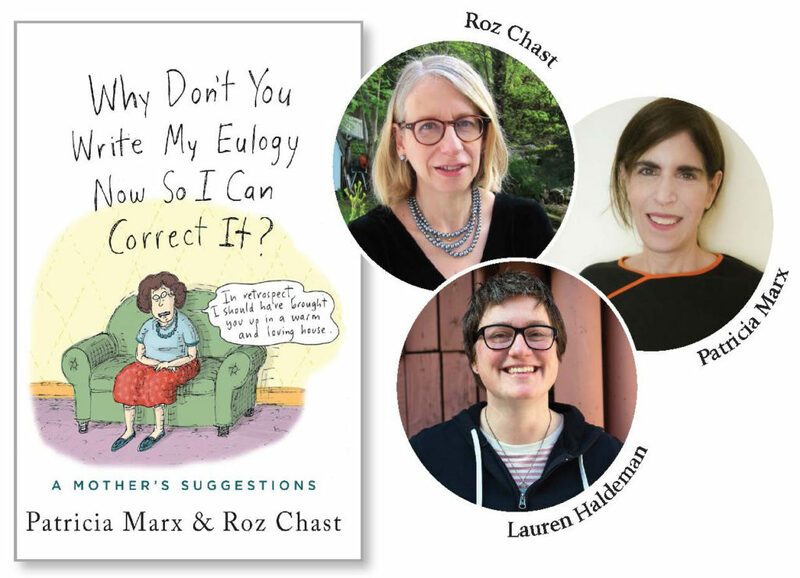 Patricia Marx and Roz Chast will be happy to sign books after the event. If you feel guilty about throwing away leftovers, put them in the back of your refrigerator for five days and then throw them out. If you run out of food at your dinner party, the world will end. When traveling, call the hotel from the airport to say there aren’t enough towels in your room and, by the way, you’d like a room with a better view. Why don’t you write my eulogy now so I can correct it? Patricia Marx has been contributing to The New Yorker since 1989. She is a former writer for “Saturday Night Live” and “Rugrats,” and is the author of several books. Marx was the first woman elected to the Harvard Lampoon. She has taught screenwriting and humor writing at Princeton, New York University, and Stony Brook University. She was the recipient of a 2015 Guggenheim Fellowship.